Whether you are looking after your home or your business premises, security will be one of your top concerns. Not only are you looking out for the safety and security of your family or employees, but the nature of your business may be such that it requires additional measures to deter break-ins, damage, or theft. The new GDPR rules (General Data Protection Regulation) are also more likely than not to be something that you need to take into consideration, whether you are a data holder or processor. We have talked about the various security systems available before and you can always check back for a refresher at any time. This month we take a closer look at the pros and cons of video-controlled entry systems as they are becoming increasingly popular for both homes and businesses. What is good about video-controlled doors? 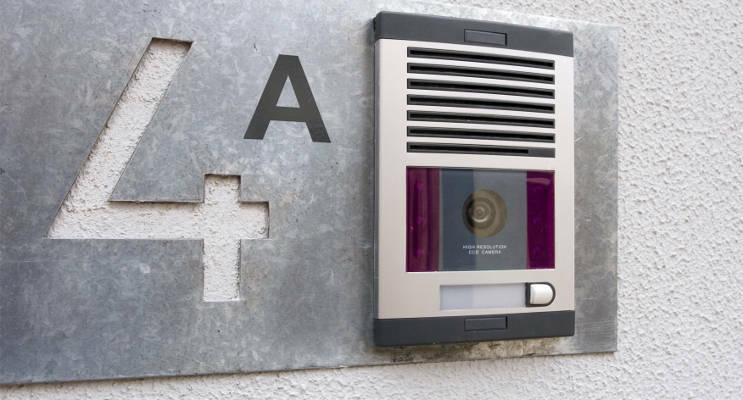 There is plenty that will make you consider installing a video-controlled entry system. While audio-controlled doors are great, video adds the obvious element of being able to see who wants to gain access. More importantly, it can show you more about what they may be carrying with them and what is going on around them – for example, are they likely to be letting others in as well? For homeowners who may be expecting a tradesman to call round it is a way of asking to see some identification before letting them in, particularly where you have not met the person before. If you hear an unfamiliar noise at night then it is also possible to turn it on and see what is going on around your front door. While the view may be somewhat restricted it is still better than having no visual option at all. The initial set-up can also be used to help create the right conditions for viewing as much of the area close to your front door as possible. For business owners, the ability to cross check entry logs against video footage means they are able to corroborate entry and exit times or time worked if there are any disputes. As with any technology, the more elements you introduce the more can go wrong. With video-controlled doors as well as having the audio component, you also rely on a working camera, and lighting system to enable you to see at night. Should one of those malfunction or break down then your entry system is either compromised or you are back to relying solely on an audio-controlled entry system. Access systems that have embedded cameras and video feed are also inevitably more expensive than those that only use audio-based security features. With a variety of systems available on the market, this can be overcome and a balance struck between cost and security features that work for your home or business. For more information on video-controlled access systems, or any other security features for your home or workplace, talk to us at DNA Security. Just give us a call on 01424 718 844 for a chat or to make an appointment for a more in-depth discussion around what your options are.